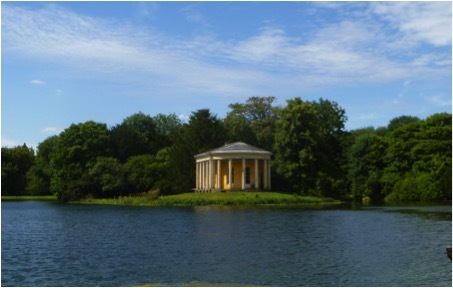 The National Trust’s specialist in Garden History, Richard Wheeler, who knows this landscape intimately, will reveal all in conducting us around the Dashwood family’s Buckinghamshire estate where we shall explore the C18 Park, the Dashwood Mausoleum, St Lawrence’s Church and The Hell Fire Caves. 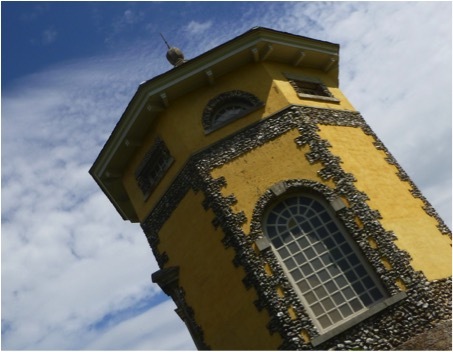 This promises to be an especially exciting and informative day during which Richard Wheeler will thrill us with the scandalous stories of the Dashwood Family who have lived at West Wycombe for over 300 years and enlighten us about the stunning landscape gardens’ history. Richard will give us a short introduction in the Village Hall (Village Hall postcode: HP14 3AB, West Wycombe Park postcode: HP14 3AG) after which we will visit the Mausoleum (Grade I) with its famous Golden Ball, the Church of St. Lawrence and the Hell Fire Caves.The flamboyant, Sir Francis Dashwood, 2nd Baronet famously founded the Dilettanti Society and the Hell Fire Club which met here. the Temple of the Four Winds (Grade II*) (above) based on an engraving of the second century tower in Athens, the three temples near the house (Diana, Apollo and Round), Daphne’s Temple and the hidden surprise at Kitty’s Lodge. The lake is the dominant feature of the park and the Music Temple, which is situated on the middle of three islands, is the focal point of the lake. The National Trust has recently repaired the cascade on the north side of the lake and reinstated the fountain in the water gardens. 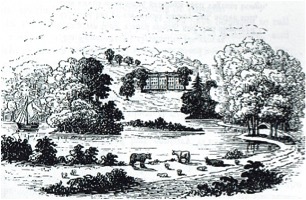 re-examined Humphry Repton’s involvement at West Wycombe and volunteers from the Trust will be on hand to describe their findings (see also Humphry Repton in Buckinghamshire & Beyond, the Trust’s recent publication available from the Bucks Gardens Trust. We will return to the village hall for tea and cakes. Please note: We will not be visiting the Palladian House today. We regret we are unable to offer refunds. Book online using Eventbrite via the Gardens Trust website www.thegardenstrust.org (no extra fee). This entry was posted in The Gardens Trust Events by Charles Boot. Bookmark the permalink.